Though a power surge might only last a split second, it can easily ruin the sophisticated but delicate circuitry that now exists in everything from computers to refrigerators. While some of your equipment may be protected from damage, chances are that most of your critical appliances are totally vulnerable to devastation. Find out how to protect all those appliances and electronics that you've spent a small fortune to bring under your roof. Look around. From the refrigerator in the kitchen to the computer in the den, our homes are chock full of appliances and electronic devices. Who knows? Maybe their prevalence symbolizes something about the central role of technology in today’s world. But for the average homeowner, all of those impressive gadgets and gizmos represent something else, something more personal and immediate: a hefty financial investment. Just think of everything you own that either plugs into an outlet or is hardwired into your electrical system. Now think of how much it all cost! Having put thousands of dollars toward creating a comfortable, convenient, and entertaining place to live, any conscientious homeowner wants to protect what he owns. But maintenance efforts too often focus on the obvious problems, the ones you can plainly see—a dusty TV screen, for example, or a dirty microwave. We forget that, because they run on electricity, our appliances and electronics are vulnerable to an invisible threat: dramatic power fluctuations and surges. Indeed, most people never even think about surge protection—that is, until it’s too late. “Surges are the silent killer,” explains Kim Durkot of Intermatic, a leading manufacturer of energy management solutions. That’s because while adequate surge protection eliminates the threat, the average homeowner has instituted either no protection or too little protection. After all, power strips can only safeguard what you plug into them. So if you’ve been careful to plug your stereo into a power strip, then it’s safe. But what about your washer and dryer? As Durkot says, “Think about the can lights that cost $50 each, the garage door, the gaming consoles—these are some of what’s typically not plugged into a surge strip.” Sure, you can buy a power strip for every room, but you be overlooking that many critical appliances don’t plug into the wall; they are hardwired directly into the electrical system. Homeowners who want a comprehensive solution invariably choose a whole-house surge protection. Such devices connect directly to the electrical panel in your home and from there, guard all of your equipment, whether it’s plugged into the wall or hardwired. When surges occur, the surge protector absorbs the excess electricity, never allowing it to reach and cause damage to the belongings you love, rely on, and spent a small fortune to purchase and bring under your roof. Though you can protect your home from power surges, you cannot prevent them. They are virtually inevitable. It’s a common misconception that surges only occur as a result of lightning. To be sure, it’s wise to shield your stuff against damage from lightning, but you might be surprised to learn that lightning plays a role in the minority of cases. 60% to 80% of electrical surges occur, not because of storms, but as a result of everyday activities. According to Durkot, even “turning on the coffee maker” or “running the vacuum cleaner” can upset the steady voltage flow in the electrical system. Outside factors contribute, too. From “power grid switching by the electric company” to a “car accident striking an electrical pole down the street”, any number of seemingly unrelated events can impact your home and its contents. So if you thought the odds of a power surge in your house were on par with a bolt of lighting hitting the roof, it’s time to reassess your exposure to the genuine risks. It’s dead-simple to replace a module. “Anyone who has ever replaced an ink cartridge in a printer can replace a module in the system,” says Durkot. When the LED status lights on the device indicate that the module must be switched out, the homeowner simply snaps in the new one. The process takes about 30 seconds. It’s not the sort of task you need a professional to do on your behalf. The only time to involve an electrician is when installing the base unit. 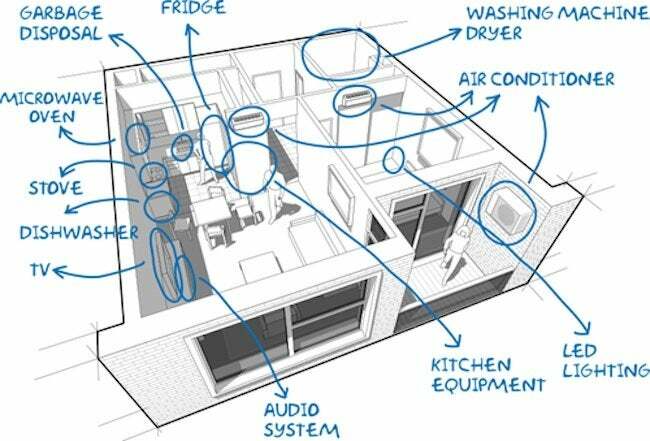 In a typical home, installation takes 60 to 90 minutes. 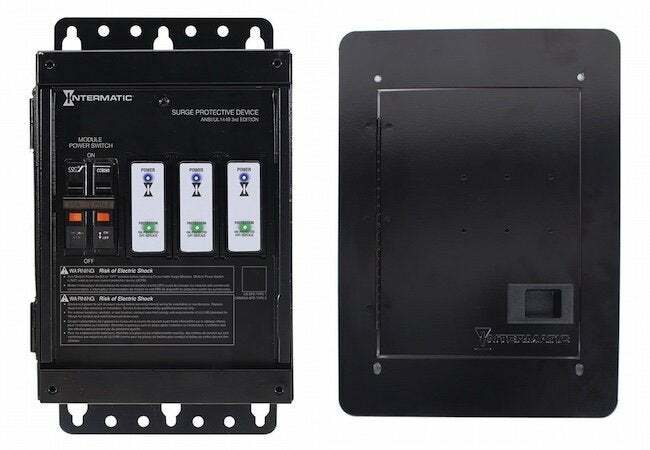 When the alternative would be to purchase (and pay for installation on) a new surge protection device every time the old one terminates, you can see why the Intermatic option makes so much sense. Though its upfront purchase price may be somewhat higher, it proves its value over the long term. This post has been brought to you by Intermatic. Its facts and opinions are those of BobVila.com.